The number above this Yellow Opera variant gets smaller with every Medal you use. Once it reaches 0, it'll hit you with paralysis. 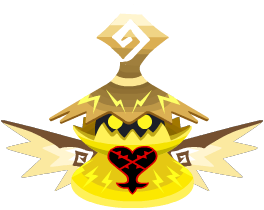 The Amber Opera is a Heartless that appeared in Kingdom Hearts Union χ. This page was last edited on 3 April 2019, at 16:43.